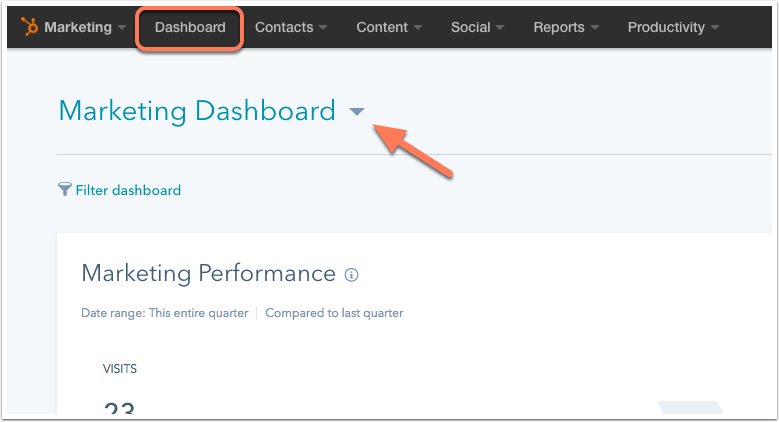 Below you'll find steps to customize the settings of your dashboards in HubSpot. You can also customize the reports that appear on your dashboard. Click the name of the current dashboard, then select a dashboard from the dropdown menu. Please note: if you are not a Professional, Enterprise, or Reporting add-on user, you will only see the standard HubSpot dashboard(s) here. At the top left, click Filter dashboard. 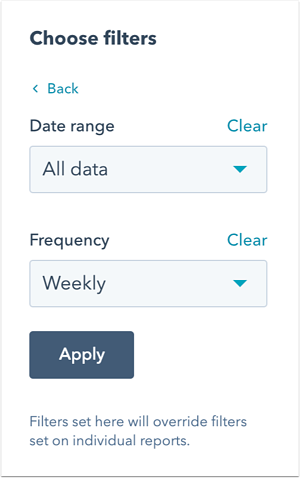 Date range: set a default date range for all reports on your dashboard. Click the Date range dropdown menu and select one of the preset date ranges or select Custom date range to set your own. Use the Frequency dropdown menu to set the time interval for data in your reports. Click Apply. Owners: filter any record-based reports on your dashboard by owners in your account. Click the Owners dropdown menu to select the owner(s). Click Apply. 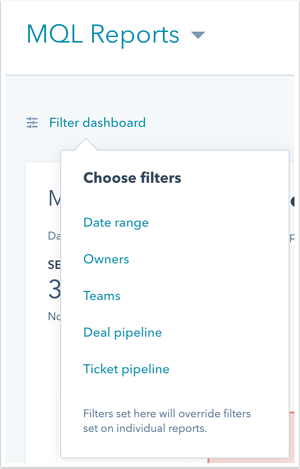 Teams: filter record-based reports on your dashboard by teams in your account. 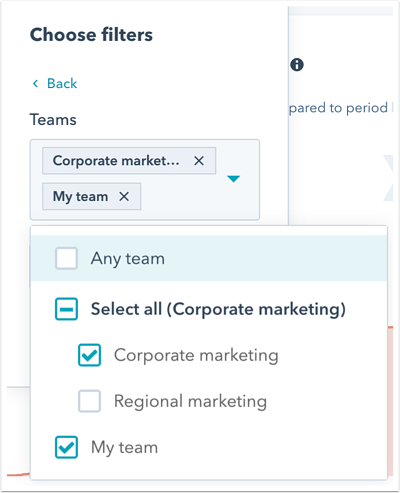 Click the Teams dropdown menu, then select the checkbox to the left of any teams you want to filter your dashboard by. Click Apply. 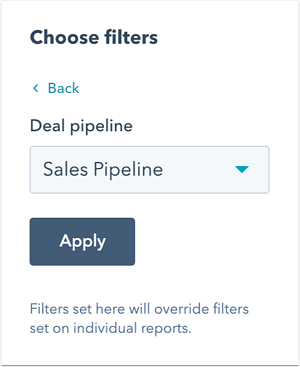 Deal pipeline: filter deal-based reports on your dashboard by one of your deal pipelines. Click the Deal pipeline dropdown menu to select a pipeline, then click Apply. Ticket pipeline: filter ticket-based reports on your dashboard by one of your ticket pipelines. Click the Ticket pipeline dropdown menu to select a pipeline, then click Apply. 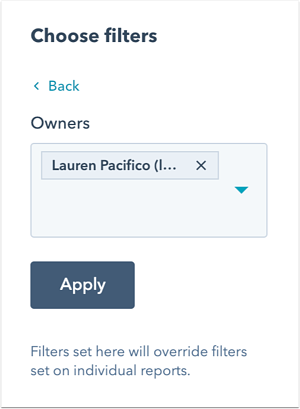 New dashboard filters will override any filters set on individual reports on the dashboard. Click the name of the current dashboard, then select the dashboard you want to set as default from the dropdown menu. At the top right, click the Actions dropdown menu and select Set default dashboard. In the dialog box, click Set default. 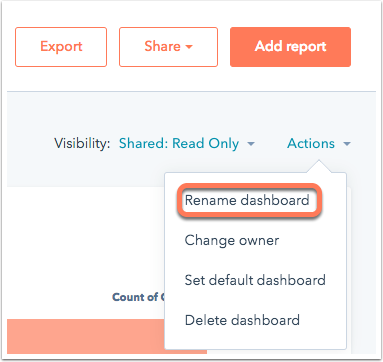 With the reporting add-on, you can make any shared custom reports dashboards that you own private or share your private dashboards with other users in your account. Please note: you can only make custom reports dashboards that you own private. 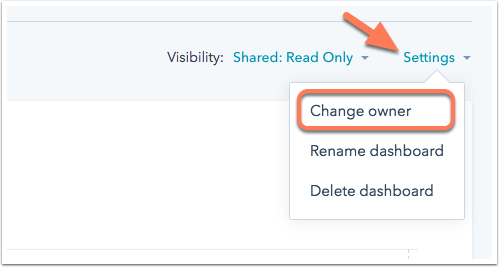 If a dashboard has been shared with you by another owner, you will not be able to change its permissions. 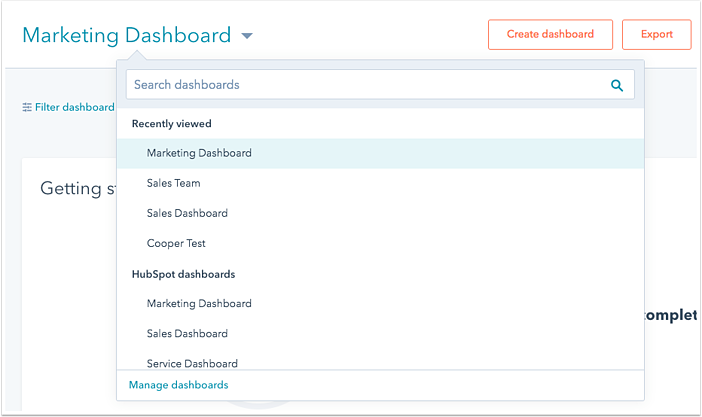 If you are not a Professional, Enterprise, or Reporting add-on user, you will only see the standard HubSpot dashboard(s) here. 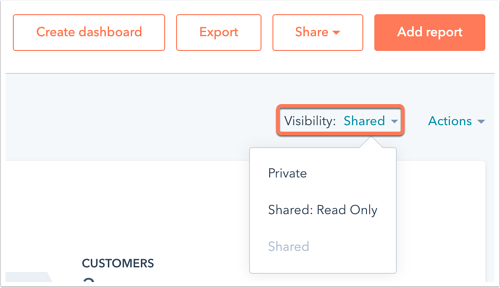 Click the Visibility dropdown menu and set the visibility for your dashboard. In the dialog box, confirm the change. You can also make the dashboard private from the dashboard manager by clicking the name of the current dashboard. Click Manage dashboards from the dropdown. Navigate to the tab where your dashboard is listed. Hover over the name of the dashboard and click Visibility. Please note: if you are not a Professional, Enterprise, or Reporting add-on user, you will only see the standard HubSpot dashboard(s) here. In order to change the owner of a report, you must have the Edit reports ownership user permission. At the top right, click the Settings dropdown menu and select Change owner. In the dialog box, click the Dashboard owner dropdown menu and select a new owner. Then click Change owner. Please note: if you do not have the reporting add-on, you will only see the standard HubSpot dashboard(s) here. It is not possible to rename standard HubSpot dashboards. In the top right corner, click the Actions dropdown menu and select Rename dashboard. Enter a new dashboard name and click Rename. 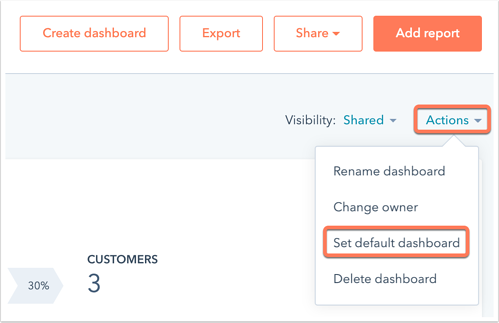 You can also rename your dashboard from the dashboard manager by clicking the name of the current dashboard and selecting Manage dashboards from the dropdown menu. Hover over the name of the dashboard, then click the More dropdown menu and select Rename dashboard. Type the new dashboard name and click Rename.